The Coen brothers go West once more with their latest offering The Ballad of Buster Scruggs, a Netflix-produced anthology of bizarre tales of the Wild West that are by turns hilarious, macabre and unexpectedly moving. “Out here in the West the distances are great and the scenery monotonous,” states cheery singing cowboy Buster Scruggs (played with doofus aplomb by Tim Blake Nelson). Given that Buster is riding through Monument Valley – Ford country and the setting for Once Upon a Time in the West – there’s a hint of meta-commentary here. Even magnificent scenery like this can get dull if there’s no invention or novelty to proceedings, but fortunately the six tales collected in the dusty old hardback book The Ballad of Buster Scruggs and Other Tales of the Wild West, complete with colour plates and tracing paper, are packed with originality, poetry and glorious wit. The first introduces us to just about the most fun you can have with the western genre. Buster is a Roy Rogers character who sings constantly – to relieve the monotony of the scenery – talks happily to his horse “Dan”, wears a goofy grin and will shoot your face off if the opportunity presents itself. There are so many sight gags – not since The Hudsucker Proxy days have the shot choices felt so giddily inventive – jokes, witty lyrics and verbal badinage that repeat viewings are essential. After such a brazenly iconoclastic opening, the next episode threatens to be slight as James Franco turns up in a Sergio Leone-style duster. However, his failed bank robbery leads to some more ludicrous situations that pepper the humour with sudden grotesque violence. For the inhabitants of Coen country, life is nasty, short and funny. Originally conceived as a Netflix series, the pieces have some tonal shifts, but the quality is so good that if we were watching these at home we’d end up bingeing them anyway. A darker turn is made with ‘The Meal Ticket’, where a travelling showman played by Liam Neeson feels his once popular attraction is no longer the ticket it once was. 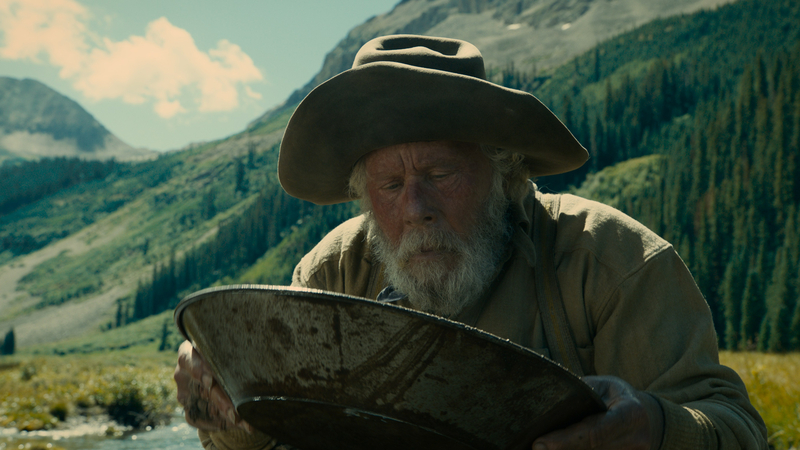 Likewise, Tom Waits’ aging prospector invading a pristine valley in the search of gold is a more sedate, but charming piece. However, the tale of an unmarried woman – ‘The Girl Who Got Rattled’ – left alone mid-waggon train when her bumptious brother dies – has the emotional depth and complexity of a full-length feature. Like the best short stories there’s a whole novel in here. This also goes for the spooky ‘The Mortal Remains’, featuring a stagecoach ride with two singing bounty hunters (Jonjo O’Neill and Brendan Gleeson), Tyne Daley (of Cagney and Lacey fame) a philosophising French gambler (Saul Rubinek), and the most tedious trapper (Chelcie Ross). With its beautifully turned dialogue, wit and razor-like edge, it makes The Hateful Eight look like it was written in crayon. The Coens don’t usually make sequels, but with a vein of comic and creative gold struck, one might be forgiven for hoping there might be a dusty ‘Volume Two’ still on the shelf.